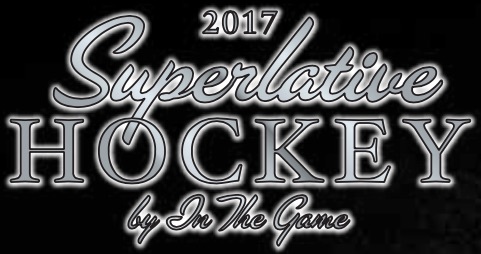 Refreshed for a new year, 2017 Leaf In The Game Superlative Hockey is back on the hobby radar with its signature high-end take. Collectors can count on four autographs or relics in every hit-only box. With the ITG brand now under the Leaf name, Superlative has been "reconfigured and revamped to provide maximum value." Although there are more choices with the memorabilia cards, the 2017 Leaf ITG Superlative autographs highlight many stars of the sport, including former greats and the top overall 2017 draft picks. 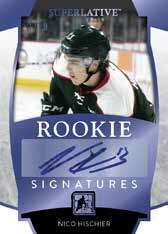 Rookie Signatures features Leaf exclusives Nico Hischier and Nolan Patrick, while Superlative Signatures honors retired stars like Mario Lemieux and Phil Esposito. Containing game-used NHL shield patches, the Superlative Shields Signatures set is both a mouthful and a sight to behold with Jaromir Jagr and Brett Hull included. Many memorabilia cards fill the remainder of the 2017 Leaf In The Game Superlative Hockey checklist. Concentrating on just one player, choices include Blades of Steel with game-used skate pieces, Retired Numbers for the players with jerseys hanging in the rafters, Superlative Shields featuring game-used NHL shields, and Superlative Super Patch cards, which contain a jumbo relic. There are also the four-piece Superlative Silver Stick Club inserts documenting subjects to surpass the 1,000-game mark, and five-swatch Superlative Careers cards for the all-time greats. Packing more players on each card, the multi-subject options include three-player League Leaders for the fans of statistics, five-player Retired Numbers Multi cards to showcase top names that share a jersey number, and six-player Super Teams, which pays tribute to notable lineups of the past. In addition, Vintage Super Teams displays three key stars from one team, while the four-player Superlative Debut and six-player Superlative Seasons sets both zero in on standout options from a specific year. All Purple Spectrum Foil parallels are 2017 Fall Expo exclusives not found in boxes. 25 cards. Serial numbered #/30. SPECTRUM FOIL PARALLELS: Blue #/15, Green #/7, Purple #/4, Silver #/2, Gold 1/1, Printing Plates 1/1. 2 cards. Serial numbered #/49. SPECTRUM FOIL PARALLELS: Blue #/19, Green #/9, Purple #/4, Silver #/2, Gold 1/1, Printing Plates 1/1. SPECTRUM FOIL PARALLELS: Blue #/9, Green #/5, Purple #/3, Silver #/2, Gold 1/1. SPECTRUM FOIL PARALLELS: Blue #/12 or less, Green #/7 or #/6, Purple #/4, Silver #/2, Gold 1/1. PRIME SPECTRUM FOIL PARALLELS: Magenta #/6, Blue #/5, Green #/4, Purple #/3, Silver #/2, Gold 1/1. View specific parallel numbering with the spreadsheet. SPECTRUM FOIL PARALLELS: Blue #/7 or less, Green #/4 or less, Purple #/2 or 1/1, Silver 1/1, Gold 1/1. SPECTRUM FOIL PARALLELS: Blue #/7 (Card #8 - #/4*), Green #/5 (Card #8 - #/3*), Purple #/3, Silver #/2, Gold 1/1. SPECTRUM FOIL PARALLELS: Blue #/12 or less, Green #/7 or less, Purple #/4 or #/3, Silver #/2, Gold 1/1. 24 cards. Serial numbered #/25. SPECTRUM FOIL PARALLELS: Blue #/12, Green #/7, Purple #/4, Silver #/2, Gold 1/1. SPECTRUM FOIL PARALLELS: Blue #/10, Green #/7, Purple #/4, Silver #/3, Gold 1/1. SPECTRUM FOIL PARALLELS: Blue #/12 or less, Green #/7 (Card #10 - #/3*), Purple #/4 (Card #10 - #/2*), Silver #/2 (Card #10 - 1/1*), Gold 1/1. 40 cards. Serial numbered 1/1. 18 cards. Serial numbered 1/1. SPECTRUM FOIL PARALLELS: Blue #/12 or less, Green #/7, Purple #/4, Silver #/2, Gold 1/1. SPECTRUM FOIL PARALLELS: Blue #/4, Red #/3, Silver #/2, Gold 1/1. SPECTRUM FOIL PARALLELS: Blue #/4 (Card #01 - #/2*), Green #/3 (Card #01 - #/2), Purple #/2, Silver 1/1, Gold 1/1. Superlative has a great player line-up, but the cards look very generic with little variation based on previous years and other sets from Leaf. The sell return on most of these cards is much less than I expected them to be. I enjoyed In The Game Used much more than the Superlative collection this year. Just wish they wouldn’t have used so much chincy colored foil print on the cards, as it chips and spots easily. Average at best.